According to different counts, there are still 50.000 – 60.000 elephants left in Asia. This sounds a lot but if you know that there were about 150.000 pachyderms only in Thailand at the beginning of the 20th century, you get an impression of how important the conservation of these unique animals is. Now there was – and still is – an emotional discussion about whether touristic projects with elephants in human hands are good or not. We like to explain why our project was set up: We are firmly convinced that the conservation of these animals can only be successful by working together with the local people. Elephant conservation is a tradition in Thailand that last for several thousand years. Especially in Northern Thailand, working elephants were intensely used in the logging industry. 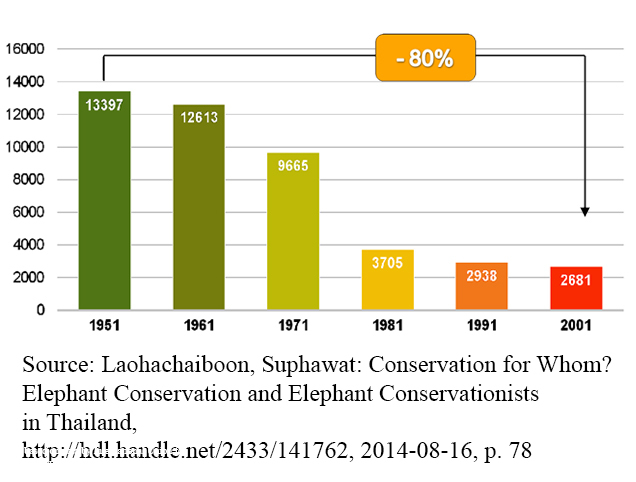 The population of Asian elephants decreases from year to year. Today, there are only about 3.000 trained working elephants left and about 1.650 – 2.000 elephants living in wildlife. Logging, the sector that domesticated elephants were working in for several centuries, was forbidden in 1989. Since then, the only way for elephants to earn money for themselves and their owners lies in the tourism branch. Elephants have fed whole families until there were no more forests to get cut down. The animals, that can become up to 80 years old, needed a base for a living – as well a as humans do. Here, tourism was the only way. With the set up of various camps, which mainly were targeted to short rides with a basket on the elephant’s back, this repositioning of elephant conservation started. To grand the best possible individual interaction with the animal on the one hand and to enable an unstressed life in tourism for the elephant, we chose a different way. But what does this really mean? The center of the criticism regarding tours with elephants is animal protection legislation – for a good reason: in fact, in recent years, numerous camps have been opened, where profit maximization was set above the welfare of the elephants. With the requirement to serve as many customers in the shortest time possible, many animals get to their stress limits and even beyond. But if elephant camps are no longer visited by responsible guests from all over the world, it is either a bad service to the animals. Because by doing so, elephant camps are forced to turn towards clients, that only have fast fun and pure entertainment in mind. 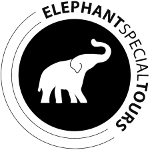 Elephant Special Tours has established itself with an approach that offers a unique concept with the individual, German-speaking support for guests and a quiet, respect-based approach to the animals. We are convinced that this special approach to bring humans and elephants together is meeting the needs of the animals and offers them the opportunity have a future in the 21st century. By guaranteeing a good life to the owners of the pachyderms and by showing them the advantages of an individual, information-driven project, we can help the elephants far more than we could by forcing the owners to let them go into wildlife. Anyway, this is not possible: the huge forests have shrunk to a fraction and the protection of wild elephants is exclusively limited to strictly regulated national parks. It is necessary to provide a future for elephants, which offers a life with humans as close to nature as possible. If we walk this way together, this can happen in their very own mountains.